LONDON, April 9, 2019 /PRNewswire/ -- The FTTH Council Asia-Pacific has been appointed as the Chair of the FTTH Council Global Alliance (FCGA) for 2019. This global platform combines the strengths of six regional FTTH Councils, enabling the exchange of research studies, information and the latest market developments, as well as the opportunity to share findings with members and other stakeholders. Under the Chairmanship of the FTTH Council Asia-Pacific, Fiber Broadband Association, FTTH Council Europe, FTTX Council Africa, FTTH Council MENA and Fiber Broadband Association LATAM chapter will be collaborating on a joint project. This joint project will focus on region-specific investment and business models, copper migration status, fiber network technology developments and other key related topics. "We are delighted with this opportunity to increase global collaboration between the Councils and working closely together," states Venkatesan Babu, President, FTTH Council Asia-Pacific. "We FTTH Council Asia-Pacific were closely involved in the founding of the FCGA and working closely since with our peers bringing a huge added value to our APAC regions, as we benefit from the cross learnings, experiences and best practices from all over the world. Each council has a regional focus, and benefits from collective knowledge, whilst being able to adapt its activities to the requirements of local operators, legislators, residential and business end-users and other stakeholders." 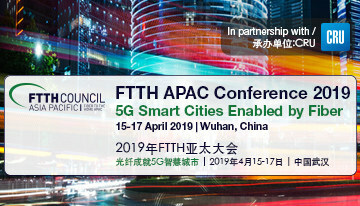 The FTTH Council Asia-Pacific is strongly focusing on bringing Fiber to Everything, and on key drivers for fiber-optic networks, especially 5G and Smart Cities. These themes will be strongly highlighted at the upcoming FTTH APAC Conference 2019, which will be next week on 15-17 April in Wuhan, China. This year's conference is focusing on '5G Smart Cities Enabled by Fiber'. The event offers a unique opportunity to explore how the Asia Pacific fiber broadband industry is deploying FTTx and deep fiber at the 'edge', creating a converged platform for Smart Cities and 5G networks. Furthermore, during the Conference, the "APAC Smart Fiber Cities Award" will be presented for the very first time in the region. The award, presented in two categories - 'Champ' and 'Challenger' - focuses on cities that are truly 'Smart'. To qualify, cities must not only feature advanced infrastructure, but must also fully integrate truly useful and innovative solutions that rely on that infrastructure, networks of connected devices, the data and the content. FTTH APAC 2019: 5G Smart Cities Enabled by Fiber will attract around 500 senior executives from the region's telecom regulators, policymakers, network operators, municipal leaders and solutions providers and offers a chance to hear and discuss deep fiber deployment strategies, regional policy developments, effective smart city strategies and converging wireless fronthaul and backhaul networks. Now in its 14th year, following great success in the Philippines in 2018, the FTTH APAC Conference will see the continued collaboration between the FTTH Council Asia-Pacific and CRU Events. In 2019, CRU celebrates 50 years in business. Over this time, we have built up a reputation for integrity, reliability, independence and authority with customers across mining, metals and fertilizers. Since our foundation in 1969, we have consistently invested in primary research and robust methodologies, and developed expert teams in key locations worldwide, including in hard-to-reach markets such as China. CRU employs over 250 experts and has more than 10 offices around the world, in Europe, the Americas, China, Asia and Australia – our office in Beijing opened in 2004.